Join the discussion on our forums! Come discuss Fluffy Squirrel Whisperer over in our dedicated Fluffy Squirrel Whisperer discussion topic. 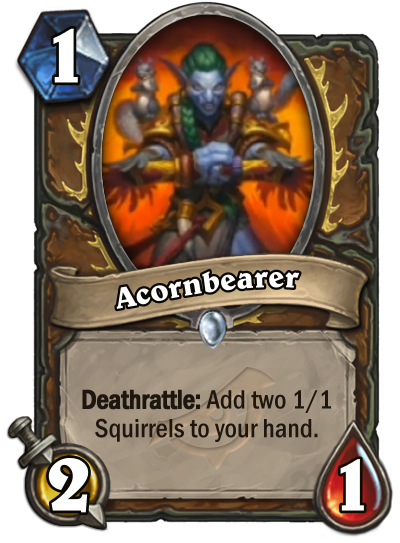 Deathrattle: Add two 1/1 Squirrels to your hand. You’d be nuts to mess with the squirrel squad. Hearthstone team is still pushing the Hand Druid archetype. I hope it will see some play. Even after the full release, doesn't it seem a little ... low-res? hearthpwn stuff is lazy... on PlayHearthstone it is high res. Nah it was more of a... They are waiting for automation to do it. But they could have done it by hand. Is Fluffy Squirels Summoner his real name?! I'm speechless ... Finally a authentic fluffy name!! Edit : restated the full place holder name, for posterity.